A smart looking, small handgun built with the same accuracy and reliability as large frame SIG SAUER pistols. 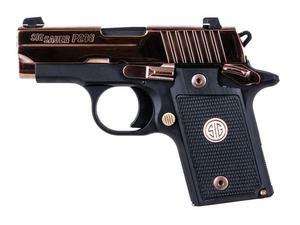 With an overall length of just 5.5 inches a height of 3.96 inches, and weighing just 15.2 ounces, the SIG SAUER P238 is the ultimate firepower in an all metal frame concealed pistol. TALO exclusive P238 Rose Gold features a polished rose gold PVD slide, matching controls and G10 grips with rose gold medallion.